If you are looking to lighten up the holidays, swap in tofu for a lighter protein option. Tofu is an excellent source of plant-based protein. Baking tofu helps to give it a chewier texture. Pair it will cranberry sauce and a side of wild rice for a delicious, festive meal. Preheat the oven to 400F. Press the water out of the tofu using a clean towel. Then slice it into 4-8 long pieces. Line a pan with parchment paper, and add the tofu. Bake for 30-35 minutes. Boil the cranberries with 1 cup of water. Reduce the heat once the cranberries start to soften and the liquid starts to steam off. Remove the cranberries from the heat. Add in 1 teaspoon of cinnamon, add more to taste. Stir in 2 tablespoons of chia seeds with ½-1 cup of additional water, adjust the water to desired texture. Remove the pits from the dates. In a high speed blender, combine the dates with ¼- ½ cup of water. Start with less water, add more as needed for thinning. Blend until smooth. Stir the date mixture into the cranberry sauce. Add more water and cinnamon if desired. 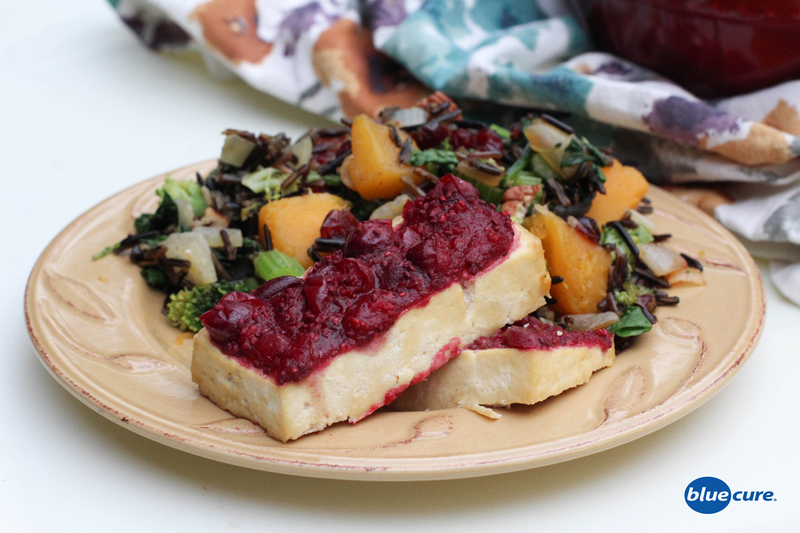 Once the tofu is finished, spread the cranberry sauce on top of each piece of tofu. Then bake for another 5-10 minutes. Serve with a roasted sweet potatoes and veggies or butternut squash wild rice.